Free Printable Countries of the World List with Capitals. Free Printable Countries of the World List with Capitals, a very useful list with all the UN Member States and Observers. Great list for teachers, students, parents, tutors. Very useful for the History and Social Studies classroom, homeschool, project, reference sheet, study, test and more. Print all the copies you need and share with your students. The student can study for an upcoming test or quiz with this list organized in alphabetical order from Afghanistan to Zimbabwe. Includes the UN Member and Observer countries in 1 page. 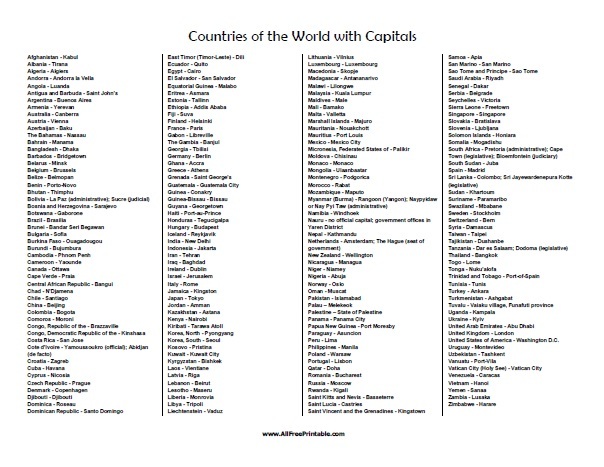 Click the link below to download or print the Countries of the World List with Capitals ready to print in PDF format.